I like to try to make connections between what’s going on and what we’re feeling. If I had to make a best guess, I’d say our last year was all about strangling every last second of fun out of every single day. (We did.) We thought we only had a year. June was all about not being able to bear leaving my family again. July was a true blue roller coaster. Now, the dust is settling. Our days feel calm and just… happy (you know… when the normal 2- & 4-year-old button pushing isn’t happening). I’m on a permanent Air Supply/Credence Clearwater Revival kick. So this is what real “relaxed” feels like. 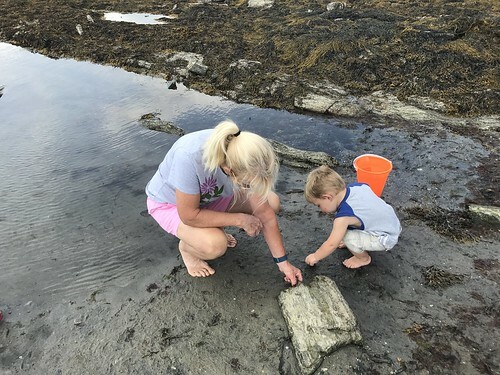 Maine is a great place to be in the summer. We’re taking full advantage. 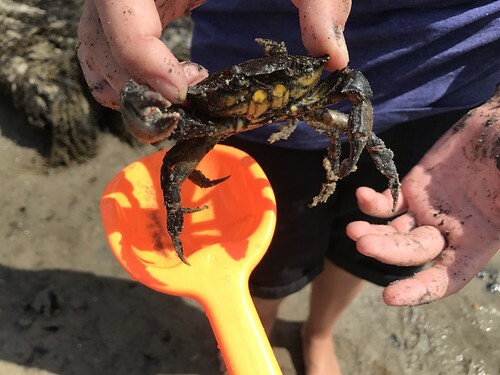 We spent a day at the beach with family. 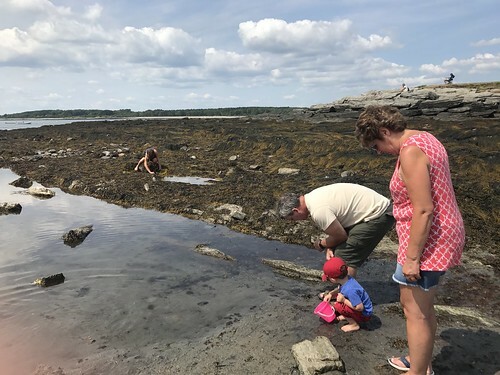 Kettle Cove in Cape Elizabeth was a little-known to us. Now it’s a top-of-the-list gem (and the parking lot was full of Maine cars! The tourists haven’t found it yet!). 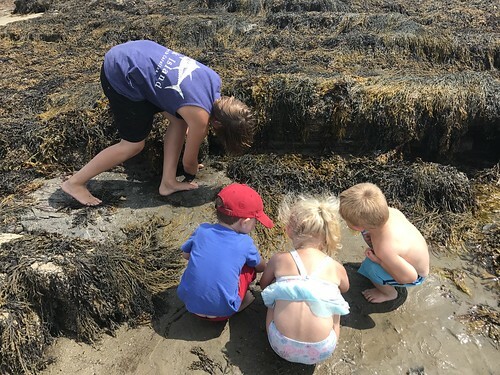 The kids searched for treasures in tide pools and picked poor little crabs out of the seaweed. 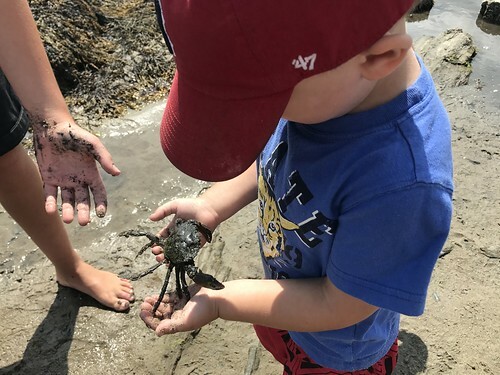 One kid (not associated with our party) even dissected a living crab (while it was still moving). I had to walk away. I’m one of those annoying “don’t kill the bug… life is precious… save Charlie the Spider… ” weirdos. It’s gotten worse since I had kids. 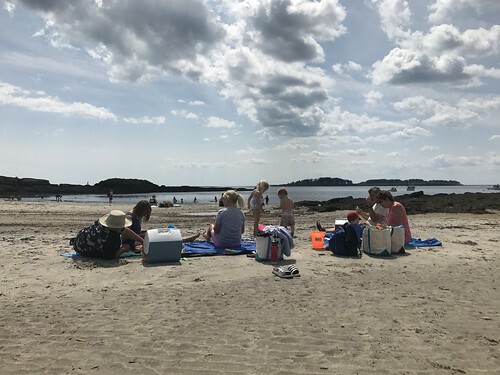 The little people all went swimming in the frigid Maine ocean (mandatory in order to earn your “Real Mainer” badge). I got up to my thighs but didn’t have it in me to go to the trouble of suiting up. We built sand castles and had a picnic on our beach blankets. How could I not be feeling joy?! After the beach we went up to “the most photographed lighthouse in the nation” (what a dumb marketing ploy… how could anyone measure something like that?!). 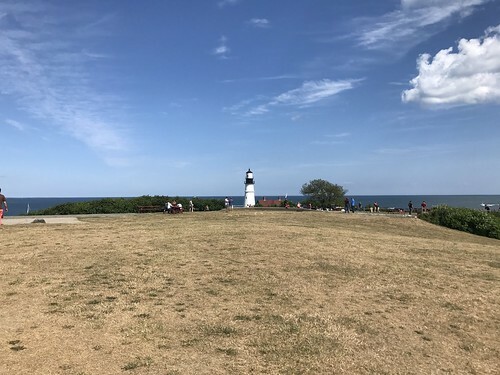 I hadn’t been to Portland Headlight at Fort Williams in years and I’d forgotten just how spectacular the area is. The fort is on a hill. 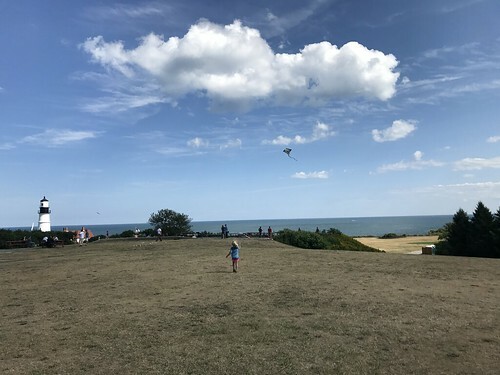 The top of the hill is famous for kite competitions because there is a perpetual wind. Plus, there’s that classic Maine view of the ocean, the bay, and all the islands. We brought several kites with us and let the kids have turns flying them. 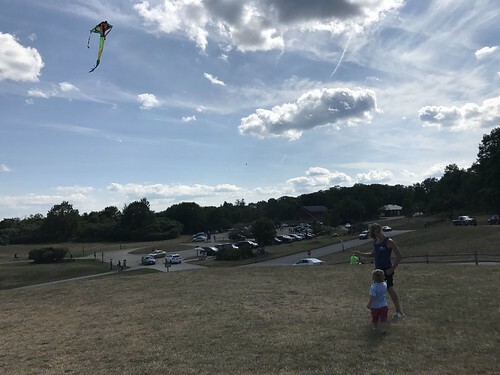 When Evie lost interest, Grandpa Mike, in a genuine hero move, took over the Elsa kite. How did I not get a picture of that?! Nate gave his all to keep the frog kite in the air. The truth is, that must be a cheap kite. It’s colorful but it’s a terrible flier. Little Leo had the best kite (BY FAR). His stayed up on its own and looked almost professional.